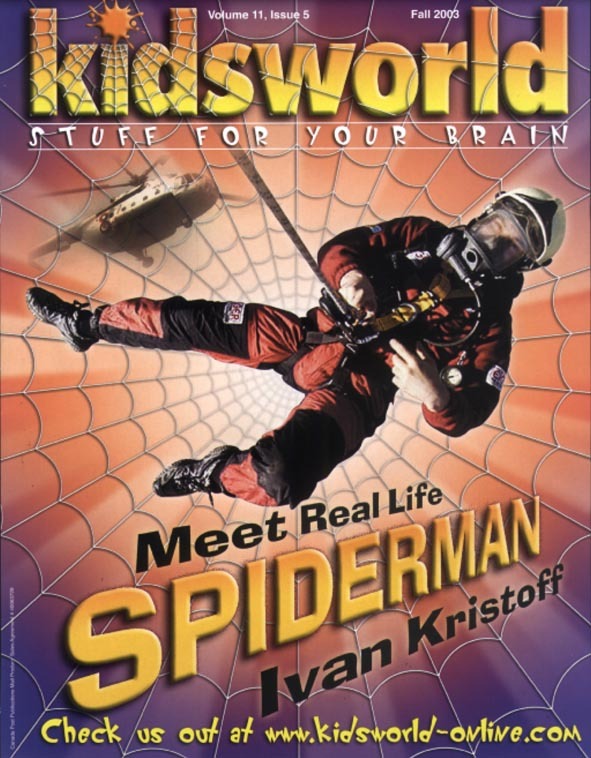 Why do reporters call Ivan Kristoff “Spider-man”. It’s because, like the comic superhero, Ivan seem’s more at home at the top of a high-rise building or dangling from a helicopter than on the ground. Originally from Bulgaria, Ivan is an expert mountaineer who has used his climbing knowledge and experience to set up a high-altitude rescue team called the Eiger HEART (High rise Emergency Aerial Rescue Team). The Eiger team teaches rescue technicians how to save who are stuck in hard to reach places. Ivan volunteers his time to do rescue work, while operating a business that also takes him high in the sky. he scales high-rises and huge office towers doing repairs and inspections hundreds of meters off the ground – on the outside of some of the tallest buildings in Canada! 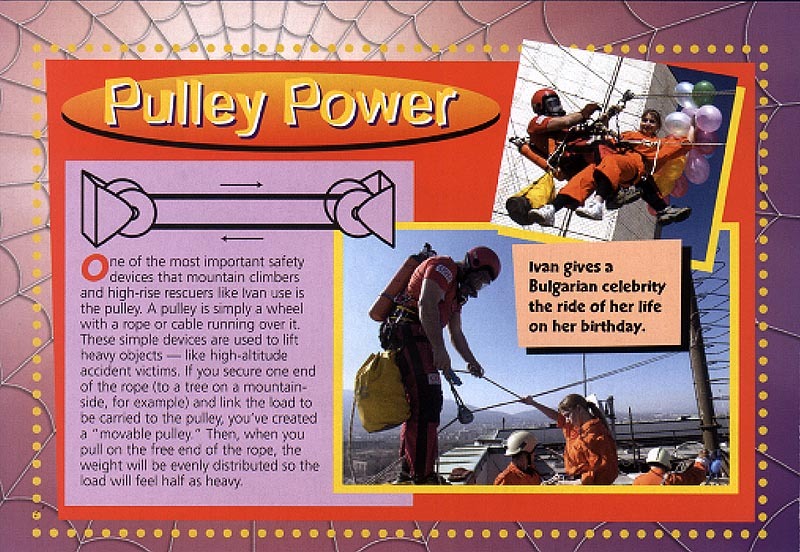 Ivan did come down to earth recently, just long enough to answer these questions from kidsworld Magazine. When did you start doing high-rise work? I used to do that in Bulgaria, because I used to do a lot of mountain climbing and rock climbing…. So when I came here (in 1990), one of the things I liked most about Canada was the high-rise buildings. That was a great motivation for me, just to be in the air. Do you remember your first rescue? When I was about 14 years old, (our caving club) had to go in a cave 300m deep, and I was assigned to be the leader of the group… After we’d spent about 8 to 10 hours in the cave, I was just about to exit and I saw this girl, she was frozen, like post traumatic stress. She was bent over and I called to her, but she wan’t responding to me. My friend came, realizing something must be wrong, and he wanted to help. So, even thought the girl was well trained, we had to treat her like a five year ild, teach her how to walk, how to step. It was very difficult, because some places were 9 meters dee, and she had to traverse horizontally. If she had slipped, she would have been history, it would have been a tragedy. But she was okay. What type of project do you enjoy most? I am involved with digital photography in inaccessible places. For example, in the year 2000, on the 10th anniversary of the SkyDome, with more than 10 000 people there, I rappelled (descended on a rope) under the roof of the SkyDome, and I did some cool shots there with a wide-angle lens. 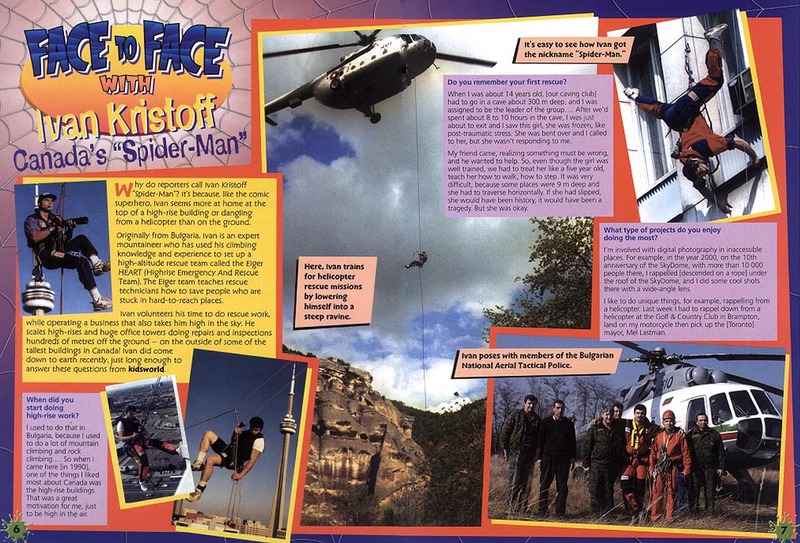 I like to do unique things, for example, rappelling from a helicopter (in a way, no one has done before). Last week I had to rappel down from a helicopter at the Golf & Country Club in Brampton, land on my motorcycle then pick up the (Toronto) mayor Mel Lastman. heavy objects like high-altitude victims. 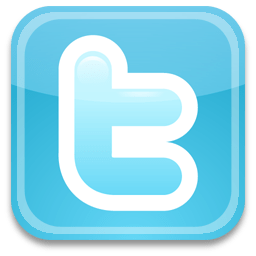 If you secure one end of the rope (to a tree on a mountain-side, for example) and link the load to be carried to the pulley, you’ve created a “movable pulley.” Then when you pull on the free end of the rope, the weight will be evenly distributed so the load will feel half as heavy. Photo: Ivan gives a Bulgarian celebrity (world famous journalist Elena Yoncheva) the ride of her life on her birthday.